The SOS-SRF raises funds in a variety of ways. Our on-line auction is held twice a year (see link above). We have a booth at the Siberian Husky Club of America's National Specialty which is held in the fall and sometimes sell items at local events if we have board members involved with them. 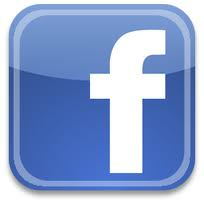 Do you use Facebook or Twitter? You can help us raise money. Click here to learn more. On our own website we offer a selection of SOS-SRF and Sibernet-L logo items including clothing, notecards, mugs, mousepads, magnets, Christmas cards and ornaments and much more. Items can be ordered through our on-line storefront. Payment for these items can be made by check, money order or through our PayPal account (info@sos-srf.org). We have several small shops on Cafe Press. Amazon Smile. This is another program from Amazon and can be accessed through the following link: http://amazonsmile.com. When you register with Amazon Smile you choose a charitable organization (as recognized by Guidestar) and a percentage of any purchase you make on the Amazon Smile site is donated to that organization. We are also a member of iGive. When you make purchases at over 700 stores through their site, we earn a sales commission. And that money goes to rescue groups to help with extraordinary expenses required to bring a rescued Siberian Husky back to good health and give it a chance of finding a forever home. Donations can be made by check or through our PayPal account (click the button on the left). If you would like to make a donation on behalf of someone, we can send them a donation card. We also have a Facebook page where donations can be made. Donations may be made to the Julie L. Moreland Heart Fund - click here to read more and make a donation. Support the SOS-SRF just by shopping at Fred Meyer with your Rewards Card. All you have to do is link your Rewards Card and scan it every time you shop at Fred Meyer. Click here to read more and link to us - number 91956. Donations may also be made through Doctors Foster and Smith "paws for a cause". Click the link to the left. We also accept donations of securities. Contact our Treasurer, Barb Branham (barbran-SOS-comcast.net) for more information. [Replace the -SOS- in the address with @]. 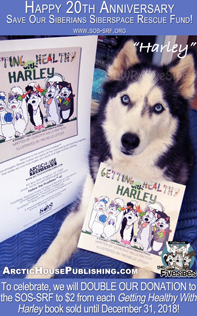 Arctic House is helping us celebrate our 20th Anniversary by donating $2 from the sale of every Getting Health with Harley book sold during 2018. Click here to visit the book store.